Strengthened by the support of the Pope, Heraclius published a doctrinal formulary in 638 called Ecthesis (“Exposition”) wherein he imposed the new theory of the one Divine will as official religion. Monothelitism, prevailed for over forty years in the Byzantine Empire. At that time the most vigorous defender of the faith was the monk, Maximus, known as the Confessor, who took part in a Synod convoked at the Lateran (649) by Pope Martin (649-655), to condemn Monothelitism. Both the Pope and Maximus were forced into exile. Maximus’s tongue and right hand were cut off as he refused to subscribe to the Monothelite doctrines. Sophronius, Maximus and Martin are today venerated by the Church as saints for their indomitable resistance to the Monothelite heresy. 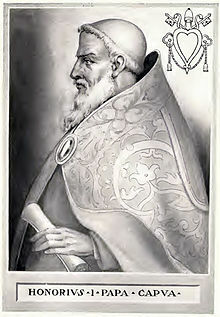 Abbé Amann judges historically untenable the position of those, like Cardinal Baronius, who retained that the IV Council Acts had been altered. The Roman legates, were present at the Council; it would be difficult to imagine that they could have been tricked or had misreported on such an important and delicate point as the condemnation of heresy of a Roman Pontiff. Referring then to those theologians like St. Robert Bellarmine, who, in order to save the memory of Honorius, denied the presence of explicit errors in his letters, Amann underlines that they raised a greater problem than the one they claimed to resolve, i.e. the infallibility of the Acts of a Council presided over by a Pope. If, in fact, Honorius did not fall into error, the Popes and the Council that condemned him were wrong. The VI Ecumenical Council Acts, approved by the Pope and received by the universal Church have a much stronger defining significance than Honorius’ letters to Sergius. In order to save infallibility it is better to admit the historical possibility of a heretic Pope, rather than shatter the dogmatic definitions and the anathemas of a Council ratified by a Roman Pontiff. It is common doctrine that the condemnation of the writings of an author is infallible, when the error is anathematized with the note of heresy, whereas, the Ordinary Magisterium of the Church is not always necessarily infallible. Pope Honorius’ letters are devoid of these characteristics. They are undoubtedly Magisterial acts, but in the non-infallible Ordinary Magisterium there may be errors and even, in exceptional cases, heretical formulations. 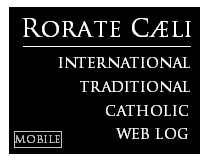 The Pope can fall into heresy, but cannot ever pronounce a heresy ex- cathedra. In Honorius’ case, as the Benedictine patrologist, Dom John Chapman OSB, observes, it cannot be affirmed that he intended to formulate a sentence ex cathedra, defining and binding: «Honorius was fallible, was wrong, was a heretic, precisely because he did not, as he should have done, declare authoritatively the Petrine tradition of the Roman Church» (The Condemnation of Pope Honorius (1907), Reprint Forgotten Books, London 2013, p. 110). His letters to Sergius, even if they were about the faith, did not promulgate any anathema and do not correspond to the conditions required by the dogma of infallibility. 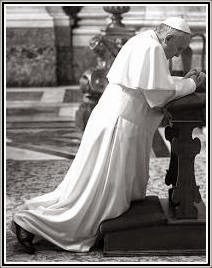 Promulgated by the First Vatican Council, the principle of infallibility is saved, contrary to what the Protestants and the Gallicans thought. Further, if Honorius was anathematized, explained Pope Hadrian II, in the Roman Synod of 869, “the reason is that Honorius was accused of heresy, the only cause for which it is licit to inferiors to resist their superiors and to repel their perverse sentiments” (Mansi, XVI, col. 126). Specifically based on these words, after having examined the case of Pope Honorius, the great Dominican theologian, Melchior Cano, sums up the safest doctrine in these terms: “It must not be denied that the Supreme Pontiff can be a heretic, of which one or two examples may be offered. However, that (a Pope) in judgments on the faith has defined something against the faith, not even one can be demonstrated” De Locis Theologicis, l. VI, tr. spagnola, BAC, Madrid 2006, p. 409).